What: My JSTOR is Your JSTOR presented at My Booth Is Your Booth, installation by Reinaart Vanhoe representing MER. Paper Kunsthalle, an independent publishing house based in Ghent. Where: Intersections at Art Rotterdam 2015, Van Nellefabriek. In the non-commercial section of Art Rotterdam, artist Reinaart Vanhoe ran a xerox copy-and-paste-DIY bookmaking workspace called "My Booth Is Your Booth". Kimmy Spreeuwenberg and I were invited to participate and we made a site specific work called "My JSTOR is your JSTOR". Working with text from the Guerilla Open Access Manifesto by written by Aaron Swartz, we designed it such a way that when photocopied, the message disappears. 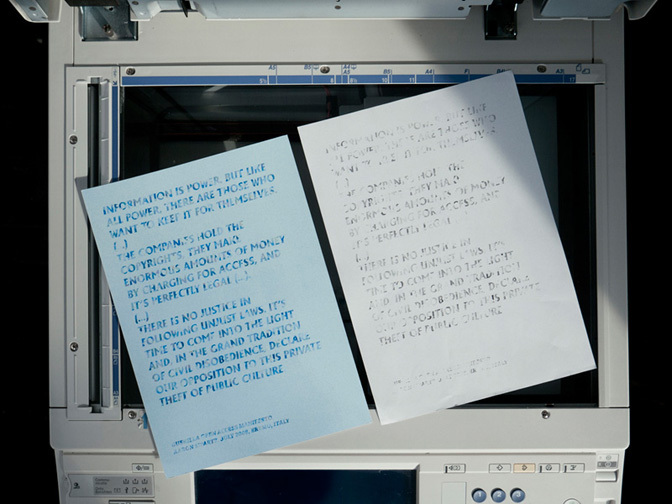 Similarly we also designed the inverse – for the message to reveal itself only after being photocopied. By designing with the concept of invisibility/visibility of information we wanted to reveal the politics of (in)accessibility. It is a reflection on how private companies such as JSTOR lock up information and implement copyright measures making it inaccessible for the wider public.